Philmac’s range of Australian made metric compression fittings are the solution for the perfect connection every time thanks to Philmac’s unique Slide and Tighten™ technology. Each fitting is pre-assembled and ready to use so there’s no need to disassemble the fittings or prepare the pipe prior to use. Simply cut the PE pipe square and slide it into the fitting until you feel the first point of resistance and then tighten the nut to the flange on the body of the fitting. With Philmac’s metric compression fittings, just slide and tighten and the job’s done! Grip ring and seal remain captive in the body when the nut is removed. Rural, Safelok and Metric components are all interchangeable as they share a common body. The fitting is manufactured from lightweight, high performance thermoplastic materials with outstanding impact, UV and corrosion resistance. The materials used are non-toxic and taint free. Incorporating all the benefits of Slide and Tighten™ technology with 100% positive feedback. The fitting has been designed so the grip ring is released as the nut is backed off, enabling the pipe to be simply pulled out of the fitting. The size of Metric fittings has been kept to a minimum making this fitting ideal to use in compact spaces. 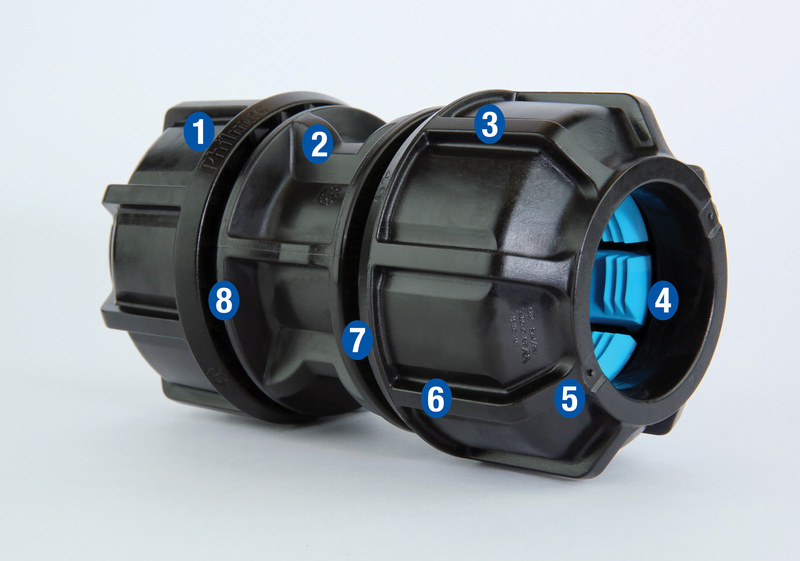 The fitting is designed to minimise pipe twist, reducing the risk of untightening joints. The flange on the body of the fitting acts as a visual cue to indicate when the nut is fully tightened. Once the nut touches the flange on the body, the fitting is in a fully tightened state. 70786400 50 x 1 1/4"
70745300 40 x 40 x 1"
90 4239 00 3/4" x 3/4"
90 4239 10 3/4" x 3/4"